The Hugo pivots (purple lines) are important resistance/support levels for the market. As you see in the chart at the bottom, every time the market hit a pivot from below for the first time, it corrected at least 20 points. I believe that either the pivot at 957 or the pivot at 1025 should be the top for the current rally. Thus if 957 is broken 1025 should be the next possible turning point. If you look at my forecast from last week , you will see that the market nearly obeyed my forecast : ). 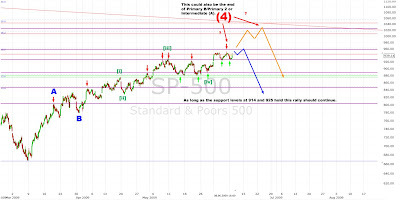 First, the market declined to the support lines at 925-930, then it rallied to the target area for wave (i)/(4) at 950-960. It's possible that 952 was the top for the current rally. But I'm NOT short right now. I wait till the market will break the support lines at 925 and 914.